Enjoy this 14 days Uganda Gorilla tour that takes you to explore and visit different places in Uganda. 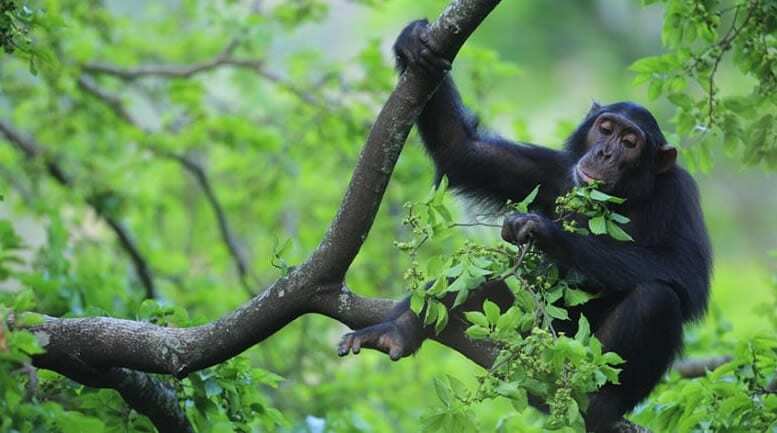 Expect to participate in activities like chimpanzee tracking, gorilla trekking, safari game drive, Boat ride and nature walks. This is the perfect 14 days Uganda gorilla safari for those who have two weeks to spare. 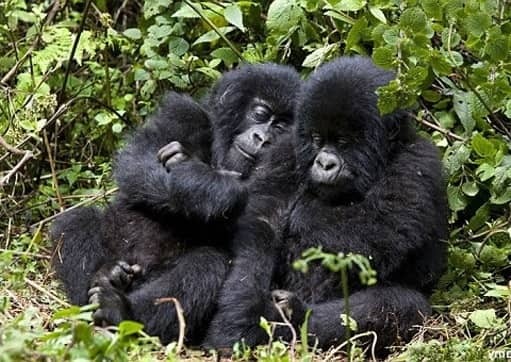 14 days Uganda Gorilla Tour . Mid range accommodation: Cassia lodge / 2 friends Hotel / protea Hotel. 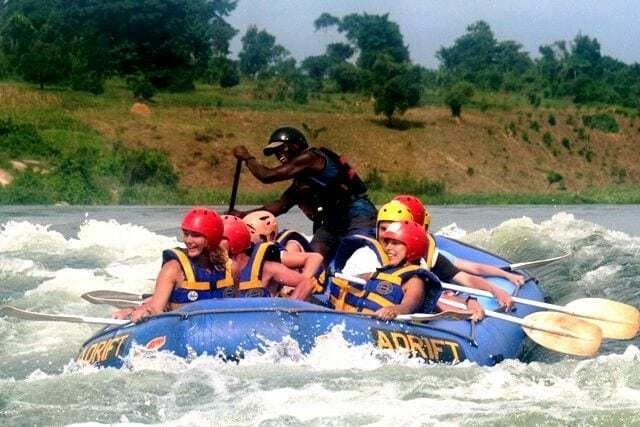 In the morning after your breakfast, you will be picked up to join the rafting team and drive to transfer to Jinja. The drive from Kampala to Jinja takes 1 and half hours . Spend the whole day rafting and lunch will be provided. You will later on drive to transfer back to Kampala in the evening. Overnight at previous lodge. Get up early for a marvelous game drive where you will have the chance of seeing interesting wild animals. These include; like elephants, giraffes, oribi, warthog s, hippos, buffalos, hartebeest, birds of all types the list is endless. The park is also a home to several predators like lions, leopards, hyenas that you may not miss out during your journey. Return to the lodge for a mid morning breakfast and later have lunch . After lunch, move down for an interesting launch cruise on the Nile. 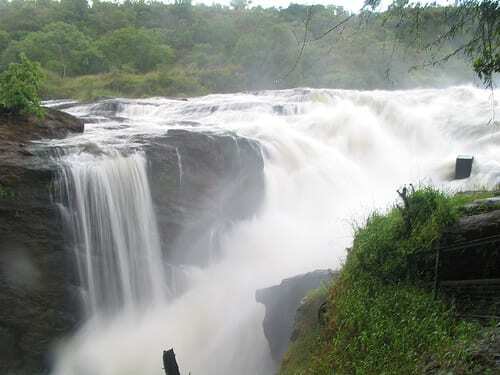 Get to see birds like the yellow footed fly catcher, ituri batis, white thighed hornbill and other interesting birds. You will have time to see the elephants, buffalos, giraffes at a closer proximity. Take there photographs too. Return to your booked lodge for dinner and overnight.If you want to just do the 3 days Murchison Falls safari, this toucan eb organised. Early in the morning, carry your trekking gears and move to the ranger station. You will be briefed about your next expedition. Move into the forest for an interesting search for the great apes. You will be entertained by the hymns from different birds that are found in the forest. Monkeys and baboon are also present and they keep jumping from one tree to the other. You will hear the Chimp call out to each other paying no attention to who might be listening. When you get to these human cousins, watch them as they feed there young ones and others are playing from the tree branches. Return to the lodge for lunch and in case you are not so tired, take a walk to the community especially those in Bigodi. Return to the lodge for dinner and overnight. For those interested in the Chimpanzee habituation experience this can eb organised at an extra USD 70 pp. Day 7: Transfer to Queen Elizabeth park. 3 hrs drive. Mid range accommodation: Ihamba safari lodge/ Marafiki safari Lodge. Budge accommodation: Simba Safari Camp | Elephant Lodge. Day 8: Game drive / Visit Salt Mines. Wake up early in the morning and drive through the park. You will get to see the early risers returning to there hideouts and others rising from where they spent there night. You will have a chance to see more animals like elephants; families of Kobs in there mating grounds, bush bucks, water bucks, and herds of buffalos, giant forest hogs, predators like lions, leopards, and hyenas may cross your site if you are lucky enough. After lunch, go visit the craters and salt mines to learn more about mining salt. Return to the lodge for dinner and overnight. Mid range accommodation: Silverback lodge / Nkuringo Bwindi Lodge / Gorilla safari Lodge / Ichumbi gorilla lodge. Budget accommodation: Buhoma Community bandas / Bwindi View bandas / Virunga Hotel /Gorilla valley Lodge, Travellers hotel Kisoro. Day 10: Gorilla trekking in Uganda. Early in the morning, take your warm breakfast to give you energy to carry one in the day’s expedition. Move to the ranger station with your tacking gears and packed food. You will be briefed and later lead to the thick luxuriant rain forest. On the way, you will meet monkeys, baboons birds if different species and several other interesting natural creatures in there habitat. You are advised to wear hiking boots and long trousers because the forest is always damp and there are beetles that may sting you. Carry on with the search but it is up predictable when you are to meet the gorillas. This is because they are always in motion and they keep on moving to look for food. You may take about 2 to 8 hours. When you get to meet them, the joy of finding them over shadows the fatigue. Spend an hour with them taking there photographs and watching them feed there little ones. Return to the lodge and relax or you may go for a community walk in the Batwa land. You will be entertained by the local Batwa pygmies and then return for dinner and overnight at the lodge of your choice. Basic – Eagles nest Hotel. 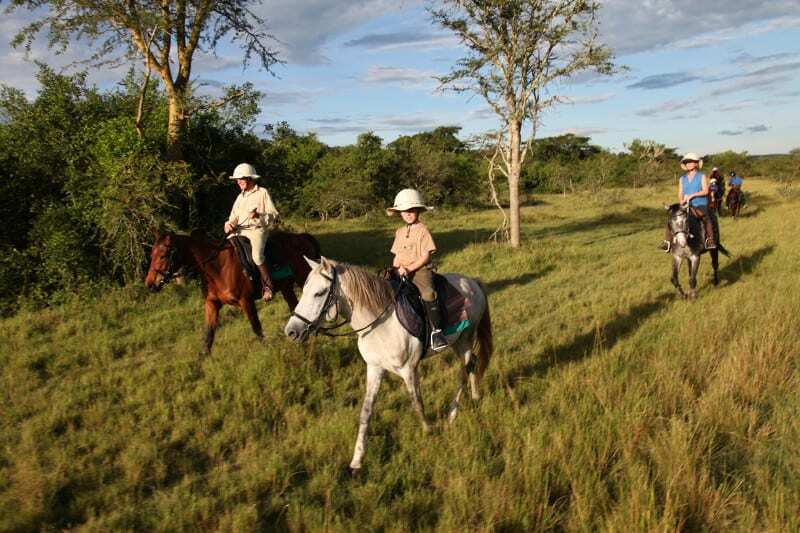 Horse ride in Lake Mburo Park. Day 12: Horse riding in Lake Mburo. have breakfast, and then go horse riding in the park searching for wildlife. The ride will take 4 hours and then return to your hotel for the rest of the afternoon. In the evening before diner you will go for a spot lite game drive in the park searching for the night dwellers. Watch out for leopards and so much more. Overnight at your previous hotel. Luxury – Kampala Serena Hotel / Kampala Sheraton hoTEL. Moderate- Cassia lodge or Munyonyo Speak resort Hotel. Depending on your flight departure time, you will be picked up from your hotel to transfer to the airport to catch your onward flight back home. End of 14 days Uganda gorilla Tour.